For whole body pain, ask about our Full-Spectrum Infrared Sauna! Cold Laser Therapy.........How does it work? The Class IV high powered K-Laser gained FDA market clearance in March 2005 and is extremely safe provided it is applied by a K-Laser certified and properly trained professional. However it is not used over the eyes due to the sensitivity of the retina; therefore all patients must wear protective safety glasses during the treatment. The laser should be painless and has no side effects when applied by a K-Laser certified, properly trained professional. During treatment the patient experiences a gentle warming effect, and at many times a profound feeling of relaxation. Sometimes the day following treatment some muscle stiffness may be felt. No. 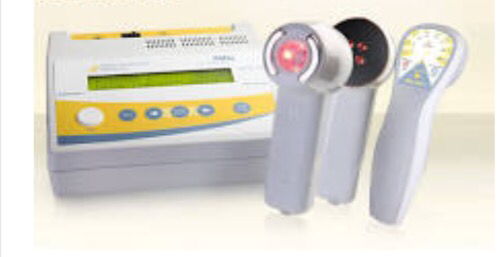 Most laser therapy devices are class III lasers or “cold/LLLT” lasers. Their power ranges from 5 milliwatts to 500 milliwatts. Madison Laser Therapy uses the K-Laser, a Class IV high-powered therapeutic laser that can deliver up to 10 Watts (10,000 milliwatts). However the Laser power is adjustable from 500 milliwatts to 10 Watts allowing for a wide range of treatment protocols. This higher power means better tissue penetration with the class IV laser system and is not attainable with cold laser devices. Tendinopathies, Carpal tunnel syndrome, Myofascial Trigger Points, Lateral Epicondylitis (Tennis Elbow), Ligament Sprains, Muscle Strains, Repetitive stress injuries, Chondromalacia Patellae, Plantar Fasciitis, Rheumatoid Arthritis, Osteoarthritis, Shoulder, Back & Knee Pain, Herpes Zoster (Shingles), Post-Tramatic Injury, Trigeminal Neuralgia, Fibromyalgia, Diabetic Neuropathy, Venous Ulcers, Diabetic Foot Ulcers, Burns, Deep Edema, Congestion, Sports Injuries, Auto & Work Related Injuries.